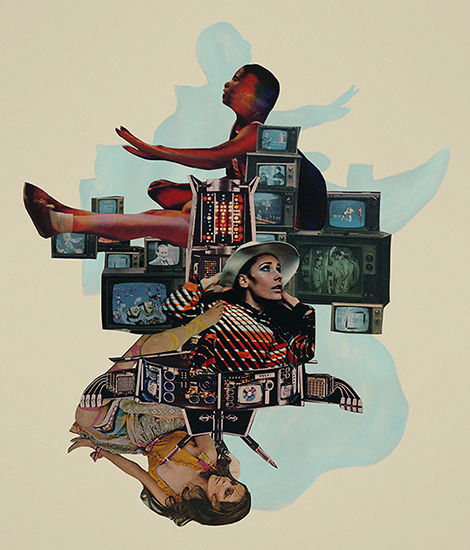 Lost Among the Streams is a piece of cut paper collage art using images found in vintage magazines and other ephemera that are then dry adhered to paper with a gel medium and augmented with gouache. The original image is roughly 16 inches wide by 18 inches tall (not including matte and frame) and was completed in August 2018. Prints for this collage and other artwork are now available from the new Mighty Joe Castro etsy shop. Inquiries about the purchase of the original piece should be sent directly to mightyjoecastro@gmail.com. On a side note, my latest musical project Mighty Joe Castro and the Gravamen recently released our debut 4 song EP – pick it up from our bandcamp page for $4 American.